The Amherst Club invites applications for grants that help people meet basic human needs and improve lives in the greater Amherst community. Social service agencies and individuals must submit project proposals to the club’s Allocations Committee on or before Friday, December 4, 2015. In past years, awards have ranged from $500 to $2,500 per project, for a total of approximately $15,000 per year. Each grant must significantly contribute to the funding of a specific project within the organization. Applications for general operations will not be considered. For information and application forms, contact Allocations Committee Chair Allen Hanson at (413) 259-1623 or download a form here. 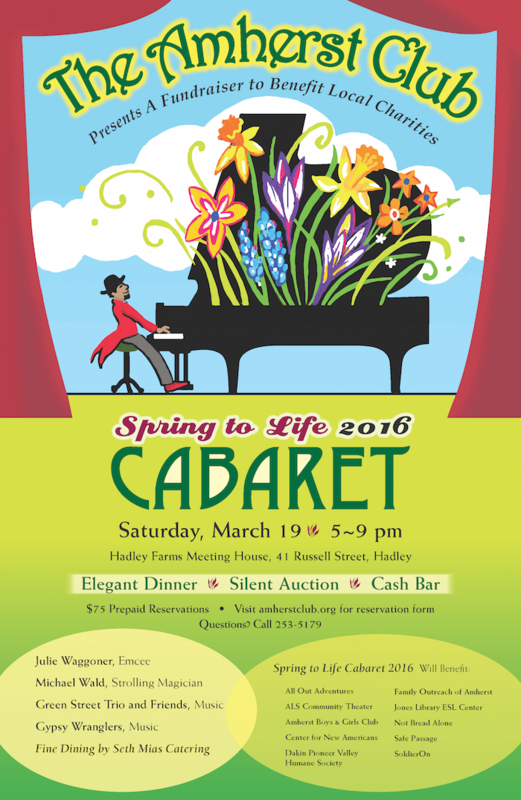 The Amherst Club sponsors “Spring to Life Cabaret,” a fundraising event showcasing music, dancing, and good food, to raise funds for charitable grants. The event will be held on March 19th, 2016, at the Hadley Farms Meeting House in Hadley. Grant awards will be distributed in April, 2016. The Amherst Club, founded in 1983, has distributed over $360,000 in charitable funds for local service projects. Membership is composed of men and women living or working in the greater Amherst area who have an interest in community service, meeting weekly for discussions, and expanding their circle of friends. In addition, we announced our new Youth Community Service Awards--offered in partnership with the Amherst Boys' and Girls' Club--for local school students.